Now that the iPad 2 has been announced, Apple is in the process of getting rid of its first generation iPad inventory, and now offers a $100 discount on all models. The ‘old’ device has been moved to the clearance section of the Apple Online Store, and currently shows available, but given the fact that stock levels are most likely fairly small, if you’re in the market for a cheap iPad, you may not want to wait too long. Meanwhile, international buyers will be happy to know that hundreds of iPad 2s are already available for pre-order on eBay. Potential buyers will have to wait until the sellers actually purchase the devices, once available on March 11, and need to be prepared to pay hefty markups, as prices are rising quickly. 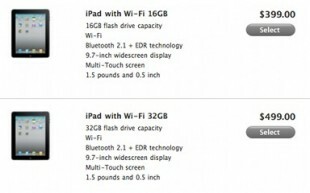 Nevertheless, iPad fans located in countries where the iPad 2 will not be available for a while now have an option to acquire the device anyway. A word of caution, if you decide to buy an iPad 2 on eBay, make sure to buy it from a reputable seller, with a flawless track record when it comes to buyers feedback. 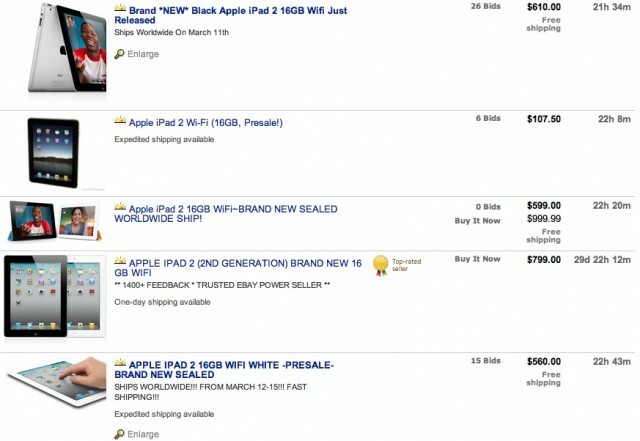 When the first generation iPad launched, several scammers used eBay to post fake iPad listings, and disappeared as soon as they were paid by international eBayers eager to acquire a new iPad before the device launched in their respective countries.